For once, RINGO STARR is the hottest Beatle. We caught him here reading an UNIDENTIFIED BOOK on an aeroplane trip with George Harrison and others. 99% of the reason that previous sentence exists is so we could use the word "aeroplane." Oh look, we did it again! 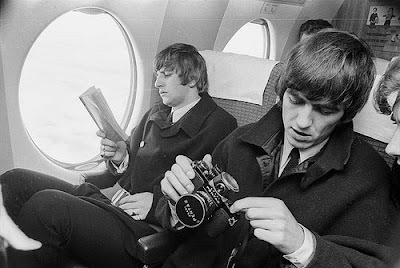 While I can't comment on the book, they're on a Vickers Viscount aeroplane (the windows are distinctive) and the camera that George is holding is a Asahi Pentax SV with clip-on light meter. Nifty.